This chapter explores factors that enhance and constrain the adoption and sustainability of Information and Communication Technologies in Universities and higher institutions of learning in South Africa. This study examines pedagogical, socio-economic and epistemological aspects of the paradigm shift in higher education delivery in Africa. Adopting and sustaining ICTs for educational improvement is a multifaceted process. As a dynamic process, all the vital elements of technology adoption need to be present in order to meet the goals of technology-enhanced higher education in Africa. It further argues that policy guidelines and strategic plans are essential for the successful adoption and sustainability of ICTs in higher education (HE) institutions in Africa. The chapter argues that the success of ICT-mediated higher education is not only technical but also political in nature. This chapter focuses on the process of adopting and sustaining Information and Communication Technology (ICT)1 for learning in universities and other tertiary institutions in Africa. This study examines the pedagogical, socio-economic and epistemological aspects in the shift of paradigm in higher education delivery in Africa. The integration of ICTs into the teaching and learning process is an innovation often needing radical change in the way in which schools operate (Haddad, 2007). As a choice tool of trade and means of academic communication, adopting and sustaining modern ICTs have become essential part of innovation and transformation process in higher education (HE) institutions across the world. As Barney Pityana (2004) expressed in the opening quotation, universities and other higher education institutions in Africa are in a defining moment. This is a time when they have to contend with rapid and imposing change or be swept away by the wind of change. 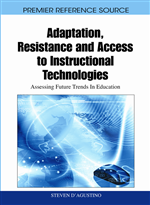 At the center of this change is the application of ICTs in teaching, learning and research. As a complex and challenging process, such innovation requires time and patience to produce sustained results. Socio-economic and political development in Africa depend on a well-educated society and skilled workforce. However, the HE institutions have the responsibility of bringing these lofty expectations to fruition. As Paul Michael (1999, p.5) argued long ago, micro-information technologies have proved “to be powerful forces in shaping the destiny of higher education.” Against this backdrop, this study focuses on ICT in education not as a course and subject of study but as a tool of learning in HE institutions across Africa. The increasing role of ICTs in education and the complex nature of integrating technology in education, underscore a closer look at the factors that enhance the adoption and sustainability of such tools in education. Such factors and guidelines will outline when, how and what ICTs can be integrated into the learning process in universities and colleges in the region. ICT in education policy is either neglected or given inadequate attention in the debate on the use of innovative technologies to expand access to and improve the quality of higher education in Africa. For this reason, ICTs are still on the periphery higher education development in South Africa (SA). Using the actor-network theoretical frameworks (Latour, 1987 and 2004), this chapter puts forward three arguments. First, it argues that the application of ICTs in higher institutions of learning is not driven by the rising demand for higher education in South Africa: it is rather influenced by other social and economic factors in the local context. Some of these factors run along the old social and economic structures/class of the apartheid era. Second, to realize the full potential of e-learning in higher education and ensure the adoption of technology-enhanced HE in Africa; and to avoid mistakes of the past and ensure the sustainability of several ICT in education projects, African countries need clear policy objectives, guidelines and practices. Third, it is argued that the adoption and sustainability of ICTs in tertiary institutions learning in Africa are socio-technical processes. Hence the success of ICT-mediated learning is not only technical but also socio-political in nature. Fourthly, this study argues that collaborative partnerships, which are essential in educational application in the developing world, do not only implement and engage in the provision of e-learning infrastructure and policy processes; they also serve as change agents needed to bring about the paradigm shift in teaching and learning in higher education in Africa. This study seeks to answer the question: What policy measures are essential for the sustainable implementation of ICTs in higher education in Africa? This study is based on qualitative methodology, with particularly emphasis on policy document review.